Claire was fed by strong encounters : Jackie Taffanel, Karin Waehner, Ingeborg Liptay, Jean Mass, Suzanne Linke, Pierre Doussaint, Georges Appaix, Nicole Mossoux and Roy Hart members ; de Patricia Kuypers and Lisa Nelson, Simone Forti, G.Hoffman Soto and Anna Halprin. 3 paths, the first being the expressionist stream of dance, the second tanztheater, and the third the improvisation movement. Those 3 paths are giving her the singular fields she’s exploring today. She also got inspired – in her performer practice – by the coporeal practices : the Feldenkrais method with Claude Espinassier, body work with Agnès Servant et Jacques Garros, continuum mouvement with Linda Rabin and the important meeting with Body-Mind Centering. She got involved in the process of learning with the SOMA association , in order to become somatic trainer for body, voice, and touch, based on the principles of Body Mind Centering, namely concerning the movement of the infants. She got the certification of Body-Mind Centering® / Bonnie Bainbridge Cohen (USA). This research allows to acces the coregraphic material from a new angle, with new supports, impulses, inspirations. Performer and Choreographer : in 1990, creation of a project « un lieu une danse» in La Celle Saint Cloud : on the vast roof of a building on the border of the forest, she built a trio based on a large amount of stools. 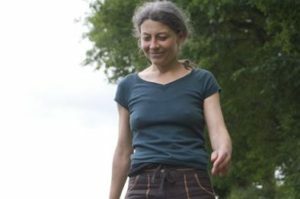 In 1993, after the birth of her solo “Colline d’argile”, dance and voice, selected in the festival of young choreographers in Pantin, her work orientated towards the young spectators – she created the company Siloe. As a pedagogue, she got the state Diploma in dance. She is running workshops, in and outside of school environment as an extension of artistic work, as well as “studies on astonishment”. She’s using the notions of process and path, in order to allow everyone to enter in the stream of movement, and to net the string of dance.